Wilier Triestina is one of the older bike brands in the business, building bikes since 1906, but that hasn’t stopped the company from eschewing tradition and trying new things. We took a close-up look at the Italian brand’s Cross Disc Carbon model in our profile of Laura Verdonschot’s bike at CrossVegas in 2015, but that carbon model isn’t available in the States. Instead, the company has launched a gravel/adventure line, including an all new steel-framed Jaroon Plus (Jaroon+) model that’s targeted towards the adventure, touring and bikepacking rider with massive 29″ wheels with 3″ wide plus-sized tires. 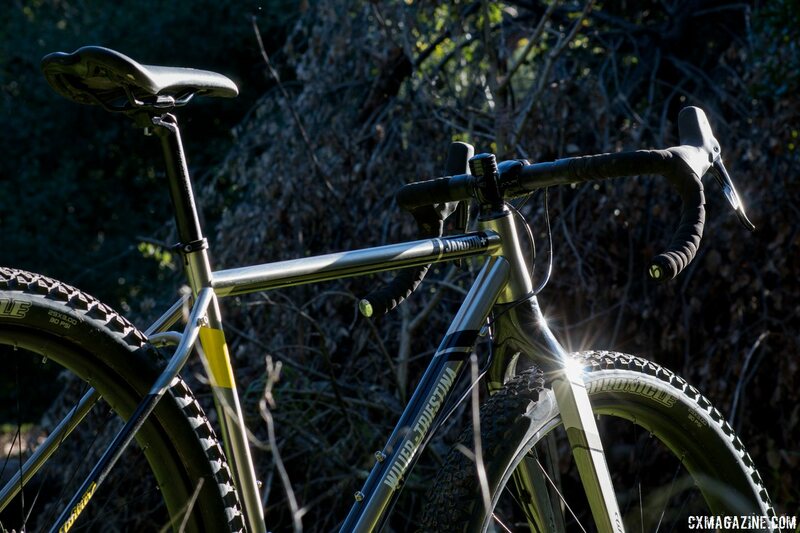 It puts the monster into monster cross, and makes every other “adventure” bike we’ve tested seem like a road bike. The Jaroon Plus is similar to the existing Jaroon model that uses a special construction design that hides all the welding material inside the tubing, creating a very clean aesthetic with smooth seams, but at first glance it looks nothing like those models. The shine and sparkle might catch your eye—this frame could easily be mistaken for stainless or titanium, but the steel is more affordable chromoly with a clear coat on top. Some observers might see such giant tires on a drop bar machine and scrunch their faces, but similarly-built bikes with mountain bike handlebars are becoming commonplace and don’t cause such reactions. 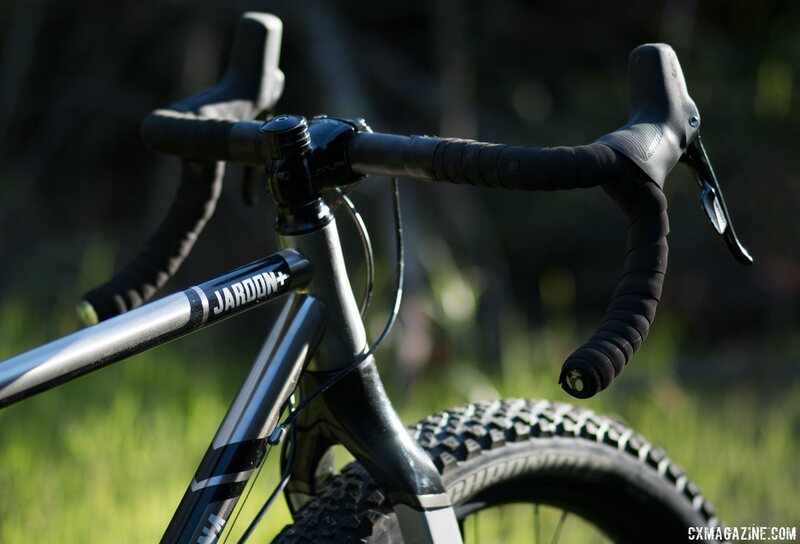 In reality, the Jaroon+ is mostly a plus mountain bike with an interesting handlebar choice that grabbed a plus-sized portion of our attention. Forgetting labels or categories, we’re interested in seeing how such a machine handles the bulk of our riding: cyclocross, gravel, trails, mixed terrain and a bit of exploration, in all kinds of weather. 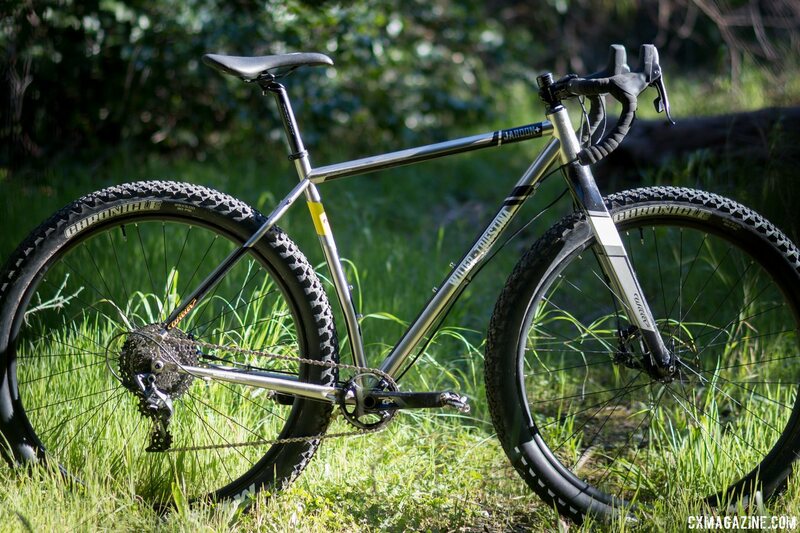 There have never been more do-it-all bike options than what the market offers today, with bikes like the Bombtrack Hook EX, Raleigh Stuntman, Van Dessel ADD and 3T Exploro being just a few of the compelling options in an exploding category. The Jaroon Plus overshadows all those bikes in tire volume. Can it take a plus-sized market share? Let’s face it, Wilier chose a very unique tire size for this all-arounder. While other bike manufacturers may be favoring 27.5/650B Plus, Wilier went big, literally. To make a frame that can fit tires as wide as three inches in width, Wilier uses the Boost 148mm wide rear axle spacing with a 12mm thru-axle. The wider spacing gives the hubs enough room to move the flanges out wider, producing a sturdier wheel. The chromoly steel frame also has mounts for racks and mud guards to keep options open for the rider. The seat tube features an ever-so-subtle bend to help with rear tire clearance and the frame has two water bottle mounts. Up front, a tapered steerer carbon monocoque fork with a 12mm thru-axle handles the wide front tire. The 12mm choice seems surprising for what is arguably a mountain bike, but Wilier says it’s to be consistent with a new cyclocross bike that’s coming (but not to the States). 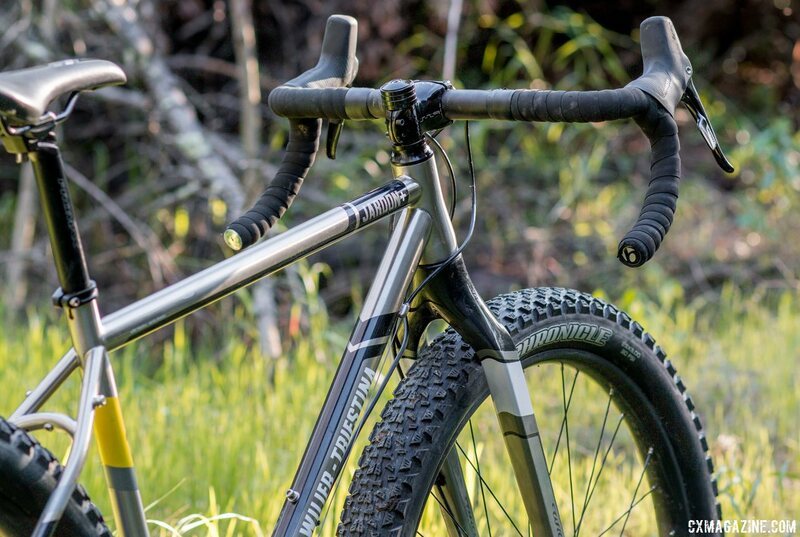 Although the head tube is on the short side, the fork offers a longer axle-to-crown (480mm) for the big tires. The rake is 46mm, in case you are trying to swap it out for suspension, but doing so might require a new front wheel, as plus forks tend to be for 110mm front hubs, while this fork relies on the standard 100mm spacing. For the geometry, some numbers to note are the slack 69.5 degree head angle and a 74 degree seat angle (for a size MD), with a 56.1cm top tube, 382mm reach and 624mm stack. Given the steep seat angle, the reach is longer than the top tube would lead you to believe. No doubt, these numbers are derivative of the huge wheels and aren’t much different than other plus mountain bikes. We sized our test bike like we would a cyclocross or gravel bike, but it’s worth noting that the bike comes with an ultra-short 50mm Promax DA-269 stem, in the style of today’s mountain bikes post Genesis geometry, but even more extreme due to a drop bar’s increased reach over a flat bar. Think such big tires will have you sitting as a high as a monster truck? Not quite. You’re up there, but the Jaroon Plus has a low bottom bracket drop of 85mm, giving you back some of the standover clearance and center of gravity positioning lost with the 1.5″ taller rubber. In the end, you sit about one inch taller than a modern cyclocross bike. Factor in some sag due to the huge tires and lower pressure, and it’s noticeable but not huge. Choose tires this big and there’s bound to be some compromises, and in the Jaroon Plus’ case, it’s gearing choice. By keeping the chainstays relatively short (44.9cm) with clearance for 3″ rubber, the chainstays flare out near the 73mm wide bottom bracket. 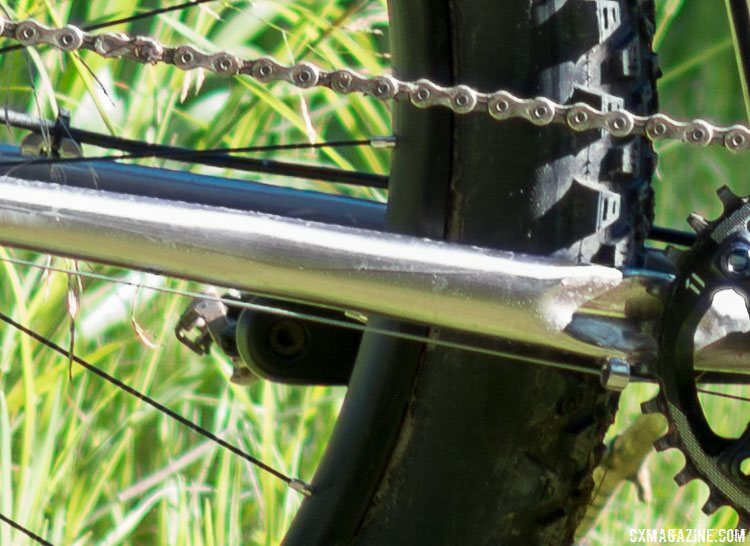 This flare limits the maximum chainring size to 32t on a 1x drivetrain. Sound like a deal breaker for your bikepacking trip? You might be able to fit a double chainring crankset, the company representatives say, but neither the company nor your reviewers have tried such a set up (yet). Our early test model had one minor issue that should be solved on production bikes. Our rear shift cable ran through a metal cable guide down by the chainstays as seen below. The metal-on-metal friction didn’t make for the snappiest shifting and got worse with mud, but Wilier says production bikes should have a full-length cable liner to reduce friction and keep the cable clean. The Willier Jaroon Plus comes in four sizes (SM, MD, LG, XL). All feature the 29 plus wheels and tires. Beyond the chromoly frame and huge rubber, the Jaroon Plus uses a SRAM Rival 1×11 drivetrain with a 32T chainring and Apex-level SRAM 1130 11-42 rear cassette. 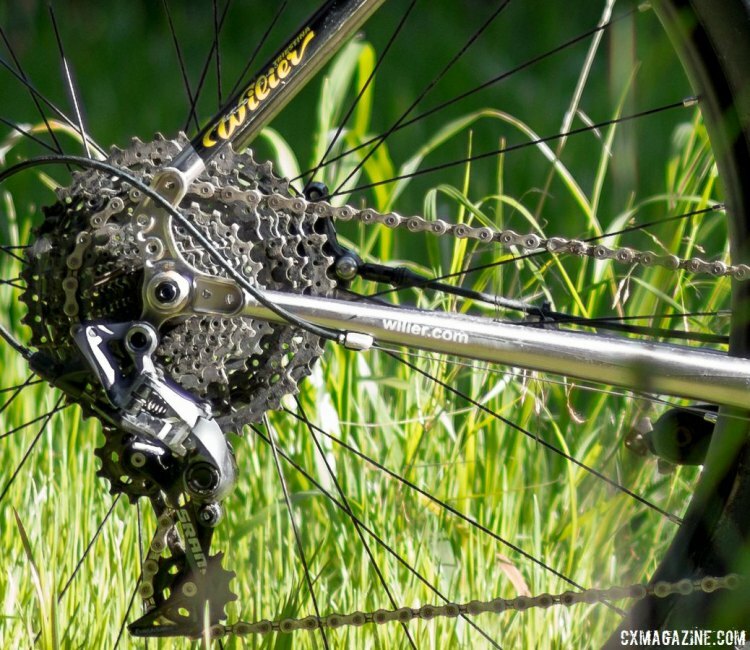 This wide-range cassette has become the hot ticket on these types of bikes, as it doesn’t require an XD driver, but it’s not light at 526 grams. SRAM Rival hydraulic disc brakes provide the stopping and the extra large 180mm rotor in the front and the 160mm rotor in the back make sense on a rig that has this much rotational momentum. The handlebar has a 16° flare that helps provide multiple hand positions for those long bike journeys. A 27.2mm seatpost is used for comfort purposes and standard Velo saddle provides enough comfort for the long haul. 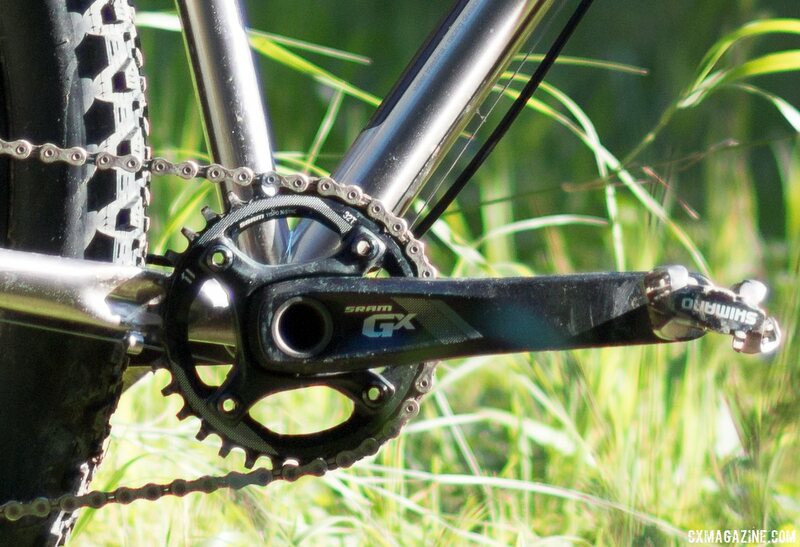 A shorty stem is included to help keep the large front from getting unwieldy. SUN ringlé Duroc 50 29 inch wheels use a double-walled rim for durability especially for riders who like to experiment with low tire pressure, which is one of the main reasons to run such wide tires. Maxxis Chronicle 29×3.0″ tires (1055 grams each!) are the default spec and can be run tubeless for ultimate traction. Our bike came already set up for tubeless use—all we needed to do was add sealant. The full package tipped the scales at 27.75 pounds complete. That’s almost a pound under list weight, no doubt largely because our test bike was set up tubeless. Still, compared to some other recent steel test bikes like the Raleigh Stuntman and Fyxation Quiver Disc, it’s within their range, and seems quite light given the high-volume rubber. And yet it’s not lost on us now or during rides that it’s still a good 10 pounds over a lightweight cyclocross bike. The complete bike has an MSRP of $2,850 USD and it is available from your local Wilier dealer now. First things first, we don’t pretend to be fat tire or plus bike experts. This is our first plus bike test, but given this initial experience, we don’t think it’ll be our last. You might think such a beast is only good for taking the road to nowhere if you’re not in a rush, with big heavy tires, higher center of gravity and what you would imagine to be sloth-like steering and handling, but the Jaroon Plus will surprise you on almost anything but pavement if you use the proper tire pressure. Have a washed-out gravel road in your future? You’ll float down it, almost as if you’re riding full suspension. Rocks, roots and stairs in your way? It’s almost as if they’re paved over. Twisty technical singletrack? While you’ll feel the bike’s weight, it navigates the turns surprisingly well, and will have you looking for more. Cyclocrossers tend to think lightweight wheels and supple tubulars are the key to floating over rough terrain, but the Jaroon+ takes another approach: long-travel rubber. We ran the tires as low as 8 psi and still never bottomed out. Tire fold in corners becomes more of an issue than bottoming out or burping at that pressure. Such a bike might be the last two-wheel vehicle you’d want to bring to a muddy, sloppy cyclocross race, but even then, the bike surprises. 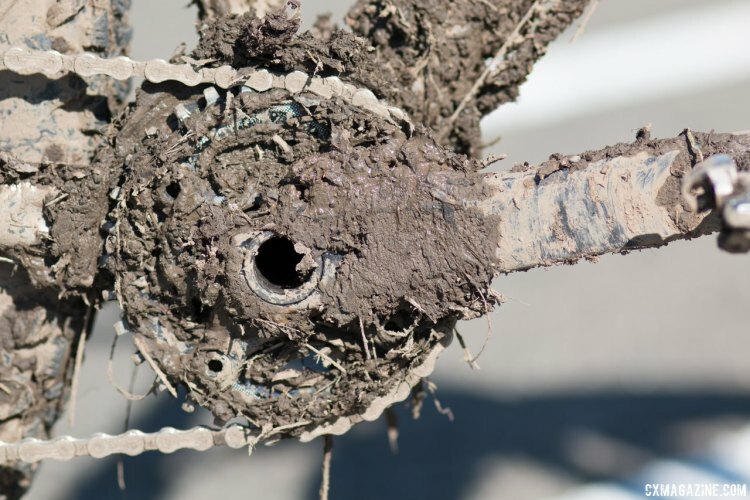 Sure, big rubber will throw around monster-sized mud chunks that will pack up around the crankset where tire clearance is tightest. The bike will gain weight as if it downs a whole bag of chips and pitcher of beer per lap. But when you hit soft mud and boggy, rutted grass? The tire volume was surprisingly an advantage. You can float over the ruts, and there’s enough contact that you don’t need to try to bite through the mud into harder ground. Lap times on a mostly-flat muddy cyclocross course were surprisingly similar to a carbon bike with high tpi tubulars! The biggest downside of riding such a monster in muddy conditions comes when you’re at the barriers or run-ups. 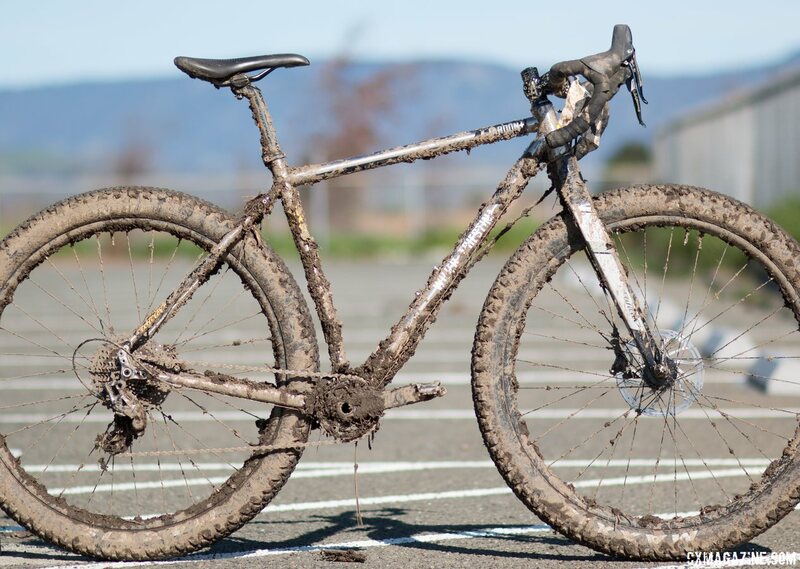 Picking up the mud-covered bike is no easy task. One tester felt twinges in muscles he didn’t know he had. Throwing it on your shoulder under such conditions risks your long-term health. If sloppy, muddy or snowy riding will make up your typical riding conditions, you’ll want to swap out the Maxxis Chronicle tires for something more aggressive. They roll fast and are great on hardpack, but even at pressures as low as 8 psi, the smooth center tread and round profile will have you sliding in muddy corners, landing Bieles-style on your drive side, and tweaking the non-replaceable steel derailleur hanger. That’s perhaps the only non-fun aspect of this bike. With cyclocross season seemingly starting earlier and earlier, often with bulletproof, bumpy dry dirt, if equipped with some lighter rubber, we could imagine taking the start of more cyclocross races with such a bike, perhaps with a taller gear (XD 10-42 cassette if not a double chainring crankset). 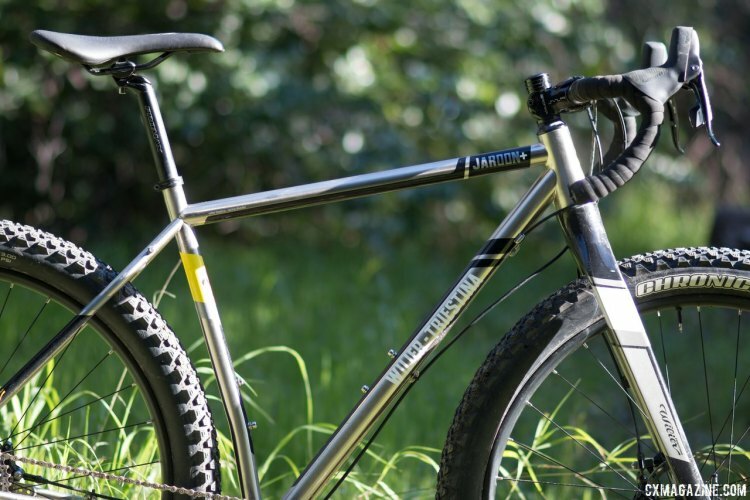 For bikepacking, the rigid frame and fork and big rubber are an appealing combination due to the simplicity and cushion with the high-volume rubber. Bringing a spare plus-sized tire along might add to your burden, but the comfort of such a setup, provided the gearing restrictions aren’t limiters, could be worth it. Stay tuned for our full long-term review. We plan to test the bike with a bit of gear, different gearing and the lighter Panaracer Fat-B-Nimble tires (which shed 300g per tire). In the meantime, you’ll find us seeking out the rough stuff, with a goofy plus-sized grin.